Howling Woods Farm is currently accepting volunteer applications. Anyone who wishes to volunteer must be 18 years or older and complete the following application. If your application is accepted you will be invited to an orientation, at which time you must provide a $25.00 fee for a background check. All volunteers are required to have a Facebook account. View the upcoming events page for locations. 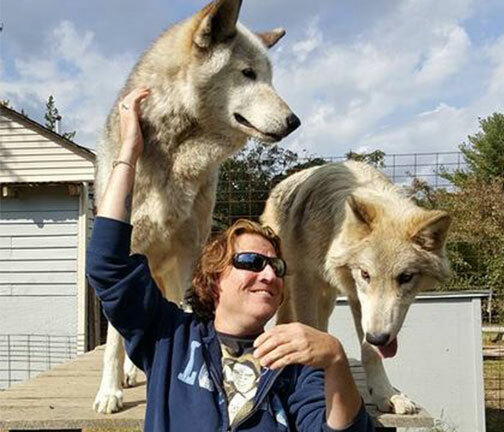 Volunteer activities at events include educating the public about wolves and wolfdogs, handling merchandise, taking photographs, set-up, and break-down, and walking the animals. Our farm is located in Jackson, New Jersey and volunteer activities take place mainly on weekends. Activities include pen maintenance, animal grooming & socialization, animal transport, containment upgrades & public education. Twice a month we have clean-up days at the farm. See our upcoming events page for dates and times. Please complete the following application and we will review the application within four weeks. There will be no formal notification of acceptance or denial. You will receive a friend request via Facebook. Please accept the Facebook friend request, and you will be added to the Howling Woods Farm Volunteer Group on Facebook. Make sure your notifications from the Howling Woods Farm page are turned on in order to receive updates regarding volunteer events.